The TygerBear Foundation has developed a unique model for the psycho-social treatment, training, supporting and prevention of trauma suffered by all members of the community (from children to care-givers) leading to the empowerment of the individual. These traumas include survivors of malnutrition, illness, neglect, physical, emotional and sexual abuse, gang violence, HIV/AIDS and Cancer. We currently receive approximately 75% of the referrals in the Western Cape, from other hospitals, other child orientated organizations, the community etc. and the amount of cases seen to daily has tripled in the last 2 years. However, the question remains, what do we do? Registration of abused children to detect and prevent repeated abuse. Workshops, lectures, seminars, exhibitions, information pamphlets, publications and research. Empower children through educating them concerning their rights. Educate children about personal safety. Advise parents about children’s needs, rights and protection. Educate people working with children and families. 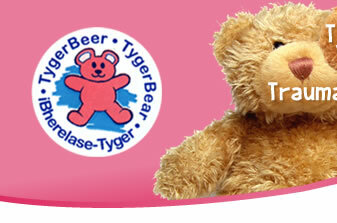 WHY SUPPORT TYGERBEAR THIS YEAR? The Tygerbear Foundation, offering this comprehensive package of Therapy, Support, Training, caring and Prevention, is the only of it’s kind in South Africa, and as far as we have been able to establish, in Africa. The unit offers an approach which is multidiscipline in its various facets, and offers both National and International training to students and professionals from as far as America, Ireland and Netherlands. Having been established nearly 10 years, we have a proven credibility and reliable track record for our service within the greater community. Survivors can usually be stabilized medically within a short period of time and are then ready for discharge from the hospital. However, due to the complexity of this trauma the psychosocial circumstances, with the accent on safety and therapy, needs more time and attention. The impact of such trauma may need more intensive therapy than just trauma counseling for example play therapy for children, family therapy and HIV/Aids counseling Besides therapy the survivors will also be cared for in a safe and homely atmosphere. This year all our efforts will be towards fundraising for the maintenance, caring and successful management of our Care Centre. As the TygerBear Foundation is a non-profit organization we rely solely on contributions from the corporate and public spectrum. Your help will behighly appreciated, but more than that, it is a necessity, for without your initiative, support and enthusiasm, we at the TygerBear Foundation can not fulfil the task of changing the world one child at a time.